French singer and actress whose interpretation of the Chanson, or French ballad, made her internationally famous. 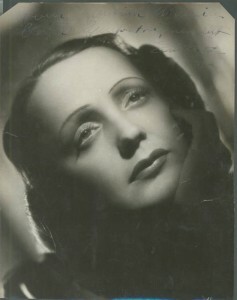 A close-up, head-shot Photograph of the legendary chanteuse in a wistful gaze, her hand on her cheek, Signed Edith Piaf and Inscribed in the dark upper portion, “Pour Monsieur Maurice Croifer / Sympathique… / Edith Piaf”. The black and white photograph measures 7 inches wide by 9 inches high.